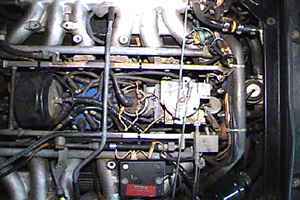 The following three images, taken in the dark of night should help locate the oil pressure sender and idiot light switches on the Jaguar XJS V-12. Overview of the engine valley. The oil pressure sender is just behind the throttle tower. 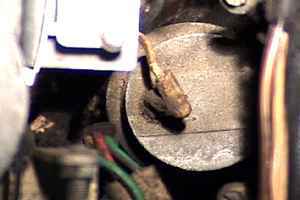 Oil pressure sender, clearly visible low and behind the throttle tower. 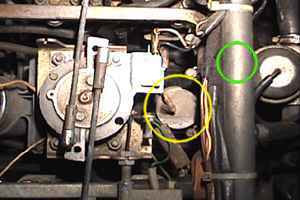 The yellow outline identifies the pressure sender, while the green outline shows the approximate location of the idiot switch, which is located BELOW the crossover pipe. 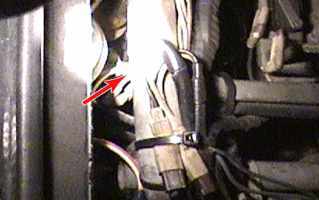 Location of the idiot switch is indicated by the arrow - the cramped parts and poor lighting conditions didn't permit visible access to the part. This image was captured while standing on the opposite side of the vehicle, so the firewall is to your LEFT, and the throttle tower is off at the upper right corner. Contents Copyright © 1998-2019 Sean B. Straw, All Rights Reserved. Theft will not be tolerated.